I have been able to avoid conflict and controversy all these years on my blog and on social media, until I posted an image of this soup on Instagram a little over a year ago. 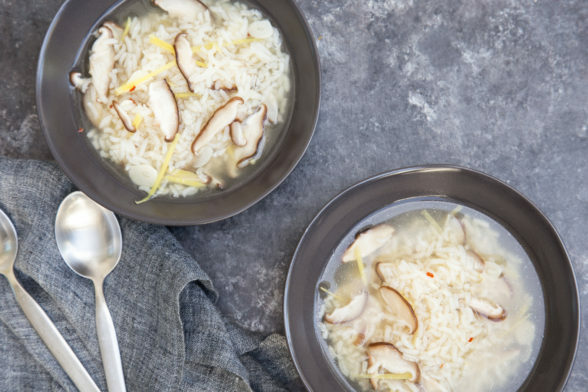 If you read my recent post on how to get well quickly, you know that I favor homemade broths, ginger, garlic and very digestible foods like soups and rice. In my post how to boost the immune system, Japanese mushrooms are a top food. My assistant Lauren has two little boys who seem to catch every virus at pre-school and she suggested to me that I teach an “immune-boosting soup.” Great idea! So I did last January and in the recipe-testing phase I posted an image on Instagram. Oh man! 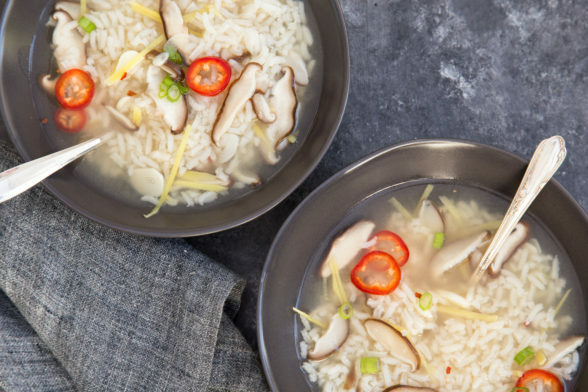 I offended so many people by calling this an “Immune-Boosting Soup.” To many, this is congee and I disrespected those who eat it by not labeling it as such. I have had congee many times before and what I know of it is that it is a thick porridge made of very well cooked white rice. The rice is cooked in water or chicken broth for a long time so that the rice really breaks down and the porridge is like oatmeal. If you google “congee” and look at the resulting images, the soup/porridge is very thick. 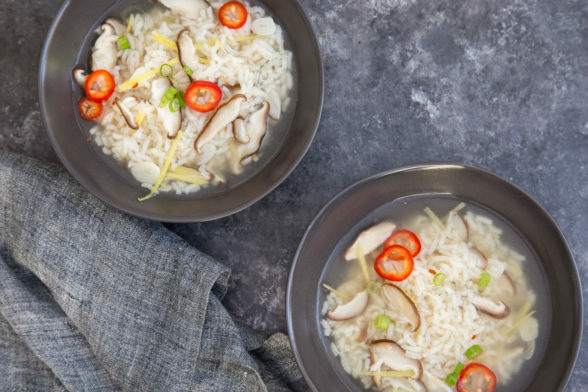 Honestly, I feel as though if I called this congee, just as many people would be offended that my rice soup wasn’t cooked long enough or wasn’t thick enough to be called congee. If you are offended by this post, it is not my intention. I’m just trying to help people make something for their families in the thick of cold and flu season that’s easy, tasty and digestible. Place the rice, garlic, ginger, salt, broth and water in a large saucepan and bring to a boil over high heat. Reduce heat and simmer uncovered for 10 minutes. Add crushed red pepper (if using) and mushrooms. Raise heat to bring up to a boil, lower to a simmer and cook for 10 minutes until rice is super soft. Taste for seasoning. Add optional add-ins at this point and warm through. Serve hot. *For the Instant Pot version, place all ingredients in the pot and cook on Manual High Pressure for 6 minutes. After the cooking time is up, use the manual release or natural release. **If you don’t care to eat the ginger, slice it into rounds and remove from the soup before serving. I have made this more than 5 times now. I LOVE it! and I feel so good after I eat this. I’ve added various veggies- it’s so versatile and always tastes delicious. PS I have your cookbook and have been happy with each and every single recipe I’ve tried! This is delicious! I added a squeeze of sriracha and it was perfection. Good morning! I’m planning to make this recipe tonight — it sounds amazing on this chilly LA day — and I’m wondering how much chicken to add. It’s just for me, my husband and son. Also this is a dumb question, I realize, but how do you cook the chicken before you add it to the soup — just sir fry it in a skillet? Thank you! We make a very similar recipe and add turkey and peas! We always make congee the day after Thanksgiving – this is what Asians do with leftover turkey lol. Very yummy and comforting… Glad you are sharing it with everyone! I can’t wait to try this! I tend to stay away from white rice, how would I incorporate brown rice instead? Would the longer cooking time for brown rice be too much cooking time for everything else? You can use brown rice and yes, you need a longer cooking time. Just keep the pot covered when you cook. All the other ingredients should be fine. After a week and a half of holiday travel and eating out, everyone is tired and run down. This recipe was a lifesaver for dinner! So quick and easy to make. Served with rotisserie chicken. Excellent for flu season and cold temps. Only note I have… caution on using the quick release. Mine splattered lots of soup during release! The holidays have wiped everyone out this year! Thanks for the advice about the quick release, I’ll make a note of it! Can’t wait to try your soup! I had Congee while in China and loved it! Oh brother. Had to come read your explanation after seeing your Instagram post! Soup looks great and I’m going to make it for my toddler and I this week. Anything to help stop the dreaded sicknesses from other kiddos at our playgroup! Also, I came upon your website after making your green muffins that were posted on valleybrinkroad.com. I’ve since bought your book and consult your website weekly for meal/dessert ideas and no joke, every single one of your recipes has been a keeper. And I’m probably in the double digits by now… You’ve gotten me excited about cooking again so, thank you! Thanks for sharing! Definitely want to try this! can’t believe people got offended by soup hahaha. This sounds fantastic! My husband made a similar soup last week for our daughter who had a bad cold — it definitely seemed to help. The soup, a hot steamy bath, and a hot lemonade with honey…and a shot of bourbon, seem to be the panacea to cure your ills. I’m excited to try this version to get an extra boost through the winter! I’ll be back to rate it. Thanks, Jennifer! Can’t wait to hear what you think. Let’s stay healthy this winter!